Over the past week, I've been working on ideas and designs for felted crocheted bags. I love the way felting looks and feels! And it is such fun to do. Until the felting process is complete, you never know exactly what your finished piece is going to look like, and that provides a welcome element of anticipation tinged with a bit of mystery. I thought that this week I would share some of the bags I've completed, some that are in the works, and the process I use for felting crocheted pieces. First, let me talk a little about the process. To felt, you need to use wool yarn. If it is a wool blend, only the wool portion of the yarn is going to felt. Merino wool does not felt well, and washable wool does not felt. As a very broad rule of thumb, a crocheted piece will shrink by about one third when you felt it. It really depends on the yarn and how tight you make your stitches. That's why I call it a "broad" rule -- it can be a bit more or a bit less than a third. I generally use a hook that is two sizes bigger than that recommended for the yarn I am working with. So, if the yarn indicates a "J" hook, I would use an "L" hook. Once I complete the piece or pieces I want to felt, I place them in a pillow case and then close and secure the end of the pillow case with a hair elastic (pony tail holder). I set my washing machine on the regular cycle and use the hottest water temperature I can get. I throw the pillow case in with a load of wash -- jeans or towels -- something with bulk works best, to provide good agitation of the wool fibers. I use the lowest volume of water I can, given the size of my load, and the smallest amount of soap possible. Then, I just let the machine do its work! If the finished size of my piece is critical, I occasionally stop the washing machine and check the pieces I am felting; removing them when they reach the correct size. Other than for the purses with the metal frames, the exact size of the final felted pieces was not essential in the bags I show below, and I simply let them go through the entire wash cycle. Once I remove the pieces from the washer, I take them out of the pillow case and gently pull and shape them to their final measurements. I then find a place where they won't be disturbed and let them dry completely. Depending on thickness and how wet the piece is when I remove it from the machine, this can take anywhere from a few hours to a few days. For example, if I remove the piece before it goes through the wringing process in the machine, I will need to roll the piece in a towel and press the excess water out before shaping it. Still, it will be wetter than a piece that has gone through the entire cycle in the machine and will take longer to dry. Now, to give you a look at some of my felting projects. This first little coin purse was crocheted using Jojoland's "Rhythm". This beautiful yarn, with a long self-striping pattern, used to come in a pure wool version that was not machine washable. The current version looks the same, but it is "washable wool" and therefore, will not felt. I had an extra ball of the original version of the yarn and so was able to use it for this bag. Believe it or not, this is the same yarn that was used in the frame coin purse with the flowers, pictured above. Just goes to show you the long and varied colors in a skein of "Rhythm". This next bag is a felted clutch. I crocheted this one using Paton's "ColorWul". What a great yarn for felting! I love the way the colors show themselves in the felted piece. For this bag I simply crocheted a rectangle of the desired size, added a chain loop on one short side, stitched my side seams, and felted it. Afterward, I just added the button. Here is another clutch using Paton's "ColorWul" in another shade. On this one, I sewed a crocheted embellishment across the flap and added colorful buttons. The last three pieces I'm previewing here are all works in progress. This first one is another little coin-size purse with a kiss clasp frame. The shape on this one, however will be a bit different - it will have a fuller, rounded silhouette. It was crocheted in Paton's "Classic Wool". The color is called "Bird of Paradise". You can see that the felted fabric is not as thick as that which results from using the "ColorWul". 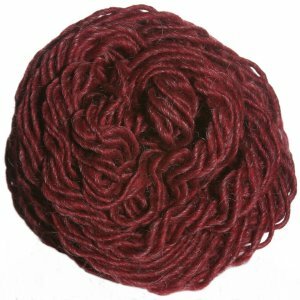 "Classic Wool" is a worsted weight yarn, versus the ColorWul, which is a bulky weight fiber. The small envelope clutch, below, was another project done in Paton's "ColorWul". And finally, this last bag was crocheted in Brown Sheep "Lamb's Pride", a bulky yarn that is 85% wool and 15% mohair. You can see the difference in texture from the bags crocheted in the 100% wool yarns in the other projects. The mohair gives it a sort of "furriness". Also, unlike the previous bags, here I decided not to stitch my side seams before felting. Instead, I am using a metallic embroidery thread to sew decorative, visible seams. I plan to continue with a whip stitch pattern around the envelope flap. Have you ever felted your crochet pieces? Do you have any felting tips? I'd love to hear about your experiences.